Lemon Poffertjes – Mini Dutch Pancakes: These extra spongy, light mini Dutch pancakes are filled with lemony flavors that would make a perfect breakfast for two. 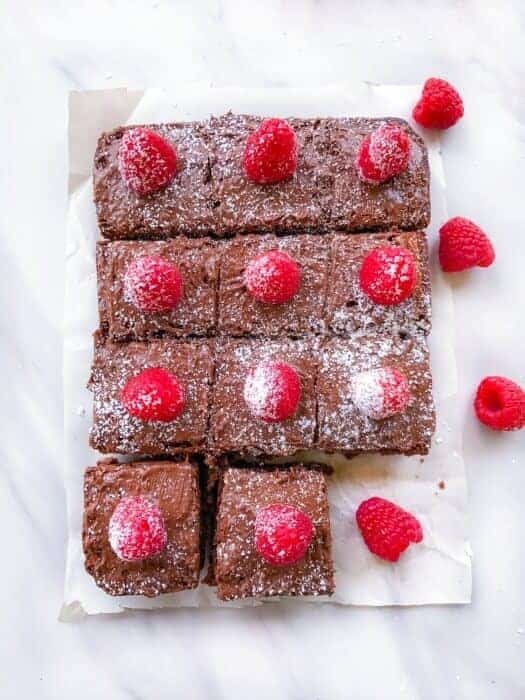 They are drizzled with dark chocolate, dusted with powdered sugar and served with fresh raspberries. “PoffertjesPoffertjes Poffertjes – buy a dozen” these words were like magic to my food hungry soul during our visit to Copenhagen. Apart from a seeing the beautiful local places, the highlight of our trip was a ‘Once in a Life’ kind of food experience in Geranium (It has the World’s Best Chef & 3 Michelin Star). After a 14 course wine and food (they describe it as lucid, light and dynamic) menu – I could totally say my ‘Soul was at Peace & I was in Gastronomical Heaven’! 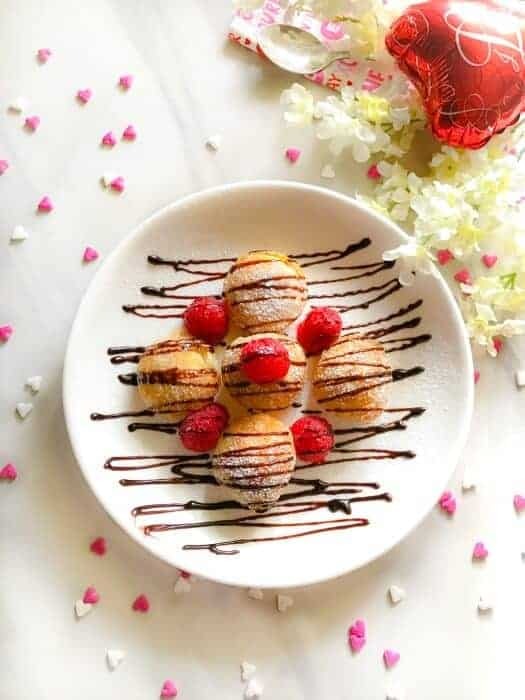 So as soon as we were back, I tried creating my favorite (the easiest of the lot) Poffertjes/Aebleskivers that I had as snack or breakfast during our trip and today I’m sharing with you’ll my Lemon Poffertjes – Mini Dutch Pancakes (Valentines Special) which makes a perfect breakfast for two. 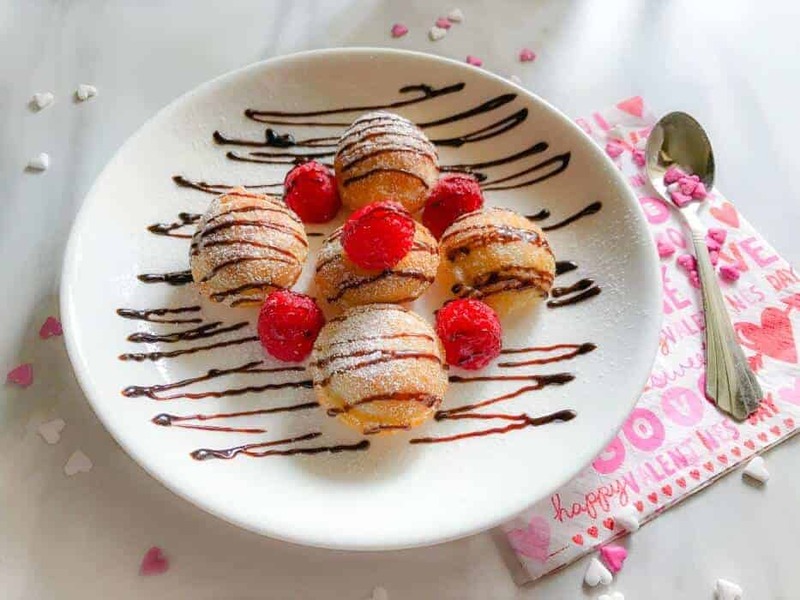 Now, if you’re wondering what is ‘Poffertjes’ – they are mini Danish pancakes that resemble a ball and are extremely spongy-airy. They are usually served with a dollop of butter and dusted sugar on top or with a berry jelly. Something very similar to our American pancakes but there are a couple of difference as Poffertjes are more light, airier and are made using buckwheat flour. 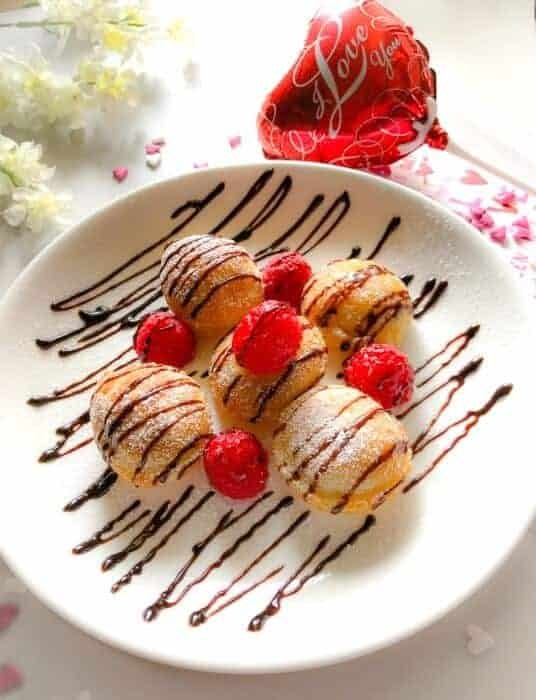 But today, I’m sharing my favorite of the many various recipes of poffertjes that I’ve tried and that is the Lemon Poffertjes – Mini Dutch Pancakes (Valentines Special). I’m using lemon and buttermilk to make it even more extra spongy and I’m using my special ‘Poffertjes Pan’ for it. It’s a non-stick pan with little dents in between for us to add the batter and turn it evenly to form a ball. The batter is really simple and these are made using all-purpose flour. You can eat the poffertjes as is too but since it’s Valentines, I’m going all out!!! Giving it some extra love n sprinkles of dusted sugar, dark chocolate sauce, and some fresh raspberries. 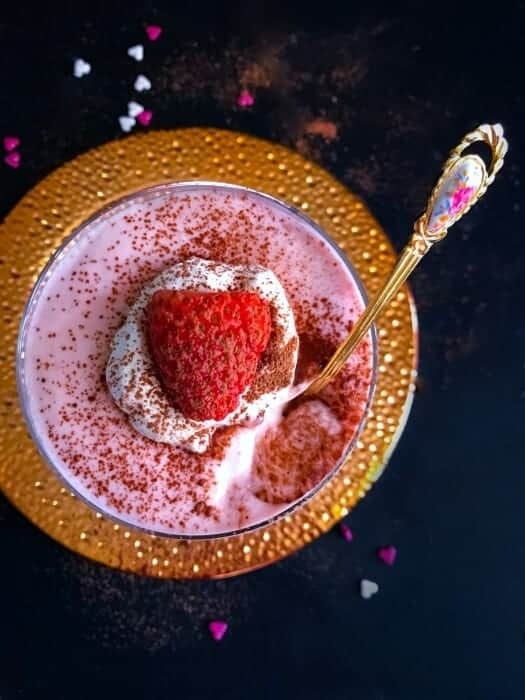 And every bite that you’ll taste will give you that lemony-berry flavor and that chocolate sauce with sugar is simple perfection. If you don’t have the poffertjes pan, you can try making them in a regular pan too (they won’t be raised or ball-shaped) but there will be no difference in taste. 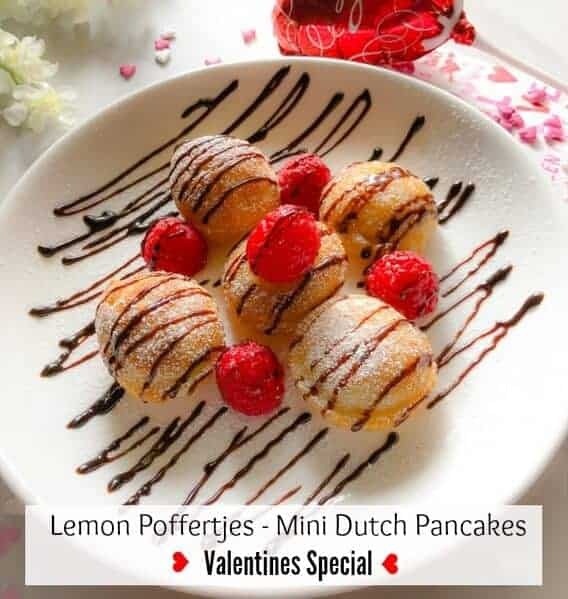 So, if you’re still looking for that one special recipe to impress that someone, this Lemon Poffertjes – Mini Dutch Pancakes (Valentines Special) can definitely be your front contender. All that lemon+chocolate+sugary+fruity combination will surely please anyone. Stay tuned for another Valentines Special Breakfast Recipe Coming Next Week ! 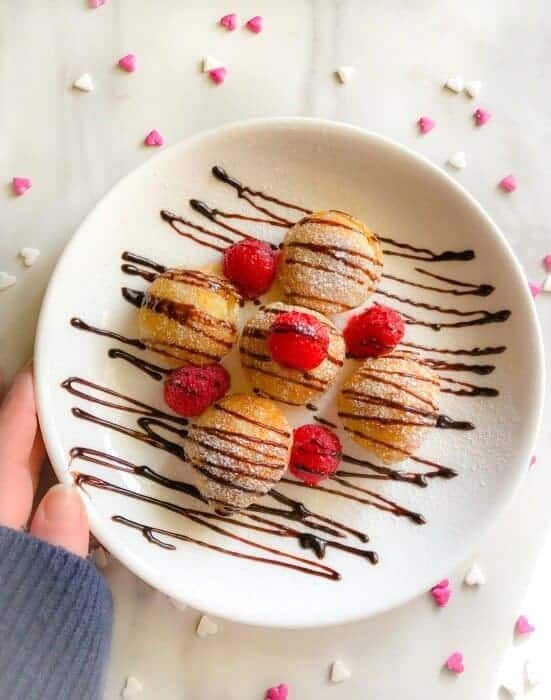 Lemon Poffertjes - Mini Dutch Pancakes: These extra spongy, light mini Dutch pancakes are filled with lemony flavors that would make a perfect breakfast for two. Heat the milk in a cup (microwave) for 30 seconds. Dissolve the yeast, sugar in luke warm milk, water, and stir and keep aside for minute (the yeast will bubble up). Whisk the egg In a large bowl. Add flour, salt, yeast and whisk to form a lump free batter. Now, add the lemon juice and whisk everything thoroughly. Drop 2-3 drops of oil in each depression of the poffertjes pan. Add 3 tbsp of batter in each depression of the pan. Wait till you see bubbles forming on top (takes 20 seconds). Using a skewer, raise the poffertjes till the remaining liquid batter falls down in the depression. Cook for 10 seconds and then flip the poffertjes to the other side. Cook till the other side is also cooked (golden brown color). Remove from pan and similarly make all the other poffertjes. Heat the pan and add 1tbsp oil. Spread the oil evenly on the pan. Using a spoon, drop 2 tbsp batter in the pan and spread it into a mini circle. Similarly place more batter till the pan is full. Let cook till you see bubbles on the top. Flip the batter and cook on the other side (till golden brown on each side). Remove from pan and cook all the poffertjes are cooked. Place 5-6 poffertjes in a plate and place raspberries around it. Drizzle with chocolate sauce and dust with powdered sugar. 49 Replies to "Lemon Poffertjes - Mini Dutch Pancakes"
These might just be the cutest (and tastiest) lil’ pancakes I’ve ever seen. That would be great, glad you liked them – Thanks Jacqui. These look so lovely! What a great treat! The mini pancakes are adorable and I am so excited that I have the right pan to make these as well. We use the pan to make a Indian recipe called Kuzhi appam and I am so excited to see a recipe from a different cuisine to make in the pan. These mini Dutch pancakes are too adorable to eat but don’t worry that won’t stop me as they sure look yummy!! We got one of these pans for a friend for Christmas. It was the first time I’d ever seen one. He’ll love this recipe! He loves doing brilliant things for his wife for Valentine’s day. Hahahha, that would be fabulous and I’m sure you’re getting breakfast in bed soon 🙂 Thanks for visiting Alicia.